Well, Laveth is only one letter removed from Lareth--less if your handwriting is like my friend Gordo's whose lower case 'r's are easily confused with 'v's. 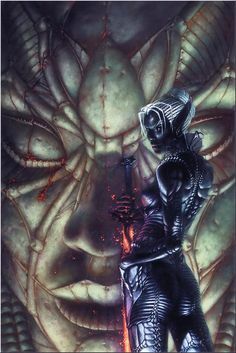 The aforementioned crackpot must have been onto something as it is now quite clear that Lolth conceived a child during her dalliance with Lareth and named her offspring after the father, the charismatic and well-endowed "dark hope of chaotic evil. "* Remember, she was so heartbroken at his death that she dispatched a 10th level assassin to murder the gang of low level PCs that killed him. Now we understand why. *It should be noted that the Fiendish Codex misleadingly credits fatherhood of Laveth to a "handsome drow wizard." That was the official story passed off by the rabidly racist drow community down in the demonweb pits, but Lolth and I**--and now you--know the truth. **It should not be pointed out that the same crackpot has elsewhere endorsed the notion that Lareth and Y'Dey, Canoness of Cuthbert are one and the same. That scenario would certainly make conception rather problematic. But hey, I'm sure Lolth could find a way. Nice!---always happy to see you return to Hommlet and its Moathouse, the wilds of B2, and the DMG Monastery, Tim! Back Issues for sale Cheap! C&C: Back Pack full of Pole Arms!